We'll post reports, some of our thoughts and photos of our trip to China in these pages. We've settled into the Jiangsu Polytechnic College of Agriculture and Forestry in Jurong and new things don't amaze us so much now, however we'll try to keep the new material coming! If you are looking for our son's blog then it is here. Jùróng is at: 31°57'31"N, 119°9'56"E.
Jurong is a city (pop ~200,000), with an associated area of smaller towns and villages bringing the population to ~600,000, that comes under the authority of Zhenjiang. Where is the Jiangsu Polytechnic College of Agriculture and Forestry? Also known as the JSAFC, it's in Jurong and its website is here: Jiangsu Polytechnic College of Agriculture and Forestry. Before we came to China we were told that we would be in Zhenjiang (pop ~1.5M) and that Changzhou (pop ~3M) would be the closest city. We made our plans for coming to China based on that information and our internet and Lonely Planet searches for info about Zhenjiang. In China it is correct to say that Jurong is "in" Zhenjiang because it is in the area surrounding, and under the jurisdiction of, the "city" of Zhenjiang, one of the major cities in Jiangsu Province. Thus when one explains to another Chinese person from another province, they are likely to know of Zhenjiang. Mapygon shows these areas quite well. The reality is that the Jiangsu Polytechnic College of Agriculture and Forestry (JSAFC) is in Jurong, about a 45-60 minute bus ride from Zhenjiang. This is a little different to the NZ understanding of being "in" a city. Changzhou is over 2 hours bus ride away. Nanjing is actually the closest city (pop ~6M). It is about 45km away and there are buses departing on the 40 minute journey to Maqun on the eastern edge of Nanjing every 15 - 20 minutes from 6am - 6pm. 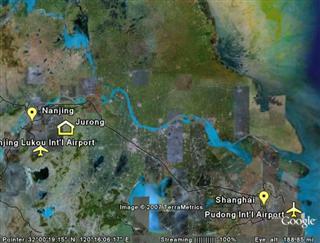 As a result, Nanjing Lukou International Airport is the closest airport (although there is no bus service direct to Jurong from the airport). There is a twice daily (high quality) express bus to Shanghai. It arrives at, and departs from, the Shanghai Railway Station North Square Bus Station in central Shanghai. The approximately 300km trip costs RMB76 (~NZ$14), takes about 4 hours and is very comfortable. With airport bus services from Pudong to the Shanghai Railway station, the total time from Pudong to Jurong is about 5hrs plus interchange time. In our experience you can usually get a ticket right up to the departure time on the day of travel except during the 3 Golden Week Holidays. It would take about the same time on the new D-series fast train service, which makes the journey from Shanghai to Nanjing in about 2 hours, and then getting to Maqun by taxi or Nanjing bus and taking the Jurong bus. Jurong has several supermarkets and department stores in addition to the many small retail businesses and markets. It has a KFC restaurant, a Pizza restaurant and many traditional Chinese restaurants and street side food stalls. It has not been gilded with the golden arches of McDonalds. In addition to the existing hotels we understand that a new Jin Jiang Inn is being built here. Contact us if you want more details on the public transport services to and from Jurong. We can also tell you about some of the other local amenities. Last night we went to dinner in the school canteen with TJ's Business English Class. TJ and a small group arranged the "booking" and ordered the dishes earlier in the day. Neil bought soft drinks, juice and beer. It was a fun time with plenty of laughing, some singing and TJ receiving several lovely gifts from her students. Neil was volunteered by TJ to sing and after the NZ national anthem there were no cries for an encore! Earlier in the day we went to the Tian Yi Emporium (one of the department stores in the centre of town) to buy a down jacket with Kirsty. TJ bought some down padded trousers and we got another jacket for Sam to grow into. It was a bit warm to be trying on down clothing but it is just the thing for watching the All Blacks hammer the Springboks at Jade stadium next month! Neil went to Nanjing and dropped off some larger items and unused western groceries at our friends' apartment in Nanjing. It was a very warm day (possibly 30deg and very humid) so he almost melted climbing the 6 flights of stairs. Then he went and collected his younger sister Kirsty from the airport. He also found out (finally) where to catch the most convenient shuttle bus back to the city - it leaves from the departures (level 2) drop off point, not the arrivals (1st/ground floor) area like the other buses. Although that information is not much use to us now! They stayed in Nanjing overnight, had dinner in a small Chinese restaurant, looked at the Drum Tower and went to the Confucius Temple area (Fuzimiao) for a night river cruise. In the morning, they went to Mochou Lake, the Fuzimiao grand market and Zhonghuamen Castle. After a lunch of Baodzi and a Starbucks coffee in Xinjiekou they went to the Ming Palace Ruins and then took the bus to Jurong. The whirlwind tour of Nanjing did not include Purple Mountain as it was shrouded in cloud/mist/fog/smog. Today, TJ went back to Nanjing to the bank and completed the TT funds transfer. Yes, it would have been more logical to do it on Monday while we were still there. No, the person we needed to help us was not available on Monday. She found out that the branch in Jurong is not "authorised" to make the transfers (at least in NZ$, maybe they can in US$). Oh well, at least the JSAFC knows this for when the next foreign teachers want to transfer funds! We spent the weekend in Nanjing so that we could say farewell to our friends and the NICF. On the bus ride to Nanjing we saw farmers planting rice in the paddies. Many 'fields' were already planted out - we can only imagine the back breaking work this is. We managed to arrange to have dinner with friends on both Saturday and Sunday evenings. On Friday we visited the Mochou Lake park. It was very pretty with some of the giant lilies in flower. It had the requisite statues, pavilions and stone features that we've come to appreciate in Chinese gardens. The lake had some platforms set up for the Dragon Boat Festival (today). We thought that the apartments that overlooked the lake would have an excellent view of the peaceful lake. Saturday was planned as a market day but about 9:30 TJ was asked to go to the bank at 10am rather than the originally planned time of noon. With some hurried juggling of a babysitter and our schedule we managed to arrive at the branch, that we'd not been to before and only had a street name as an address, only 5 minutes late. Upon entering the bank staff said that Telegraphic Transfers could only occur Monday to Friday. Bah Humbug! One of the items we bought was a tennis racket shaped electric pest killer. Powered by 2 AA batteries, it is very effective in dispatching mosquitoes - and much more fun than a fly swat or insect spray! In the stairwell to our apartment there has been a significant reduction in the population of the little flying biters! On Sunday we went to the NICF service and said farewell to our friends there. In the afternoon we managed to get to the Golden Bridge market for some last minute souvenirs and bargaining. 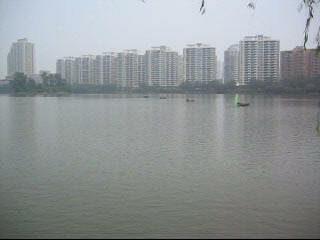 Finally, on Monday morning we bid Nanjing "farewell" and returned to Jurong. We've grown to like Nanjing not in the least because of the friends we have there. We've learned where some of the best shopping is to be had and we know how to get around on the public transport. Neil will be back there on Thursday as he passes through to collect his sister Kirsty from the airport. She is on a short holiday in China and we'll show her a little of the quiet country life of Jurong. Today we sold our electric bicycle. The new owner came and checked it out last week and we agreed a delivery date of Monday 25th June. Or so we thought: somehow there was a mix up in the translation and they came to pay the money and collect the bike today. There's an aviation adage known as the 5P's (or more colourfully 6P's): "Prior Preparation Prevents (P*ss) Poor Performance". TJ certainly took her pilot training to heart when, last week, she found out what info she had to provide the Bank of China in order to send money back to NZ by Telegraphic Transfer. She planned to go with Wangjin to the bank next week to send the money and close her account. This would have been a week in advance of our departure, so that "in the unlikely event that anything went wrong" we'd have a few days to sort it out. When Wangjin said she would be unavailable next week, TJ organised to go to the bank yesterday at 2pm. This was thought to be ample time to complete the task and then attend her 3:40pm class. In China the custom/culture is not to say No or give unfavourable answers to requests so as to let the person asking save face. "Maybe" and "tomorrow" are the code words for "No". In one hotel chain the company creed / staff poster displayed says that they must never say "No" to a customer. It seems the Bank would much rather p*ss you around for 2 hours or until you get tired of the facade and go away. Seems like the 5P's still can't prevent the 6th. "No" is one of the English words the Beijing people are learning prior to the Olympics. The final year graduates are starting to leave now. Our friend John left last week to go to his job in the north of Jiangsu. There are a few empty dorm rooms now (obvious because of no lights at night and no washing on the balcony). On Friday we went to a graduation concert put on by one of the departments. Among the many acts and Tae Kwon Do demonstrations there were some very talented students performing opera and a couple of stand up commedians: unfortunately our Chinese was not good enough to get the jokes! The new apartment block next to us has workers fitting out 3 or 4 apartments. There are continual sounds of concrete drilling and carpentry from before 7am most days. There is not much hammering noise but they appear to be using pneumatic staplers to fix some things in place. The large rooftop spaces that we used to take pictures from are now home to solar water heaters. Yesterday a small fleet of 3 wheeled electric bicycles with large goods trays ferried in sheets of timber flooring. They are like the 3rd from top symbol on the right hand side of the "No No No" photo below. The new gymnasium is making slow progress and the new block that we believe is for shops is also developing. The new government building in the centre of Jurong is being "unwrapped" from its scaffolding. It is quite a beautiful building and was impressive when its outside lights illuminated its upper storeys. And the ever continuing battle against mosquitoes continues. Ironic that in the "Lilo and Stitch" movie, mosquitoes were considered an endangered species and were the only reason the planet was not annihilated! It is true that mosquitoes in our apartment are in danger! Neil took an electric bike ride to the large monument on the edge of Jurong confirming it as a "Top Tourist City of China". Unfortunately the globe beneath the prancing horse does not have NZ on it. Perhaps the Aussies will be equally aggrieved since their Fair Country is missing Tasmania. Enroute, Neil took the opportunity to snap some photos of the utility vehicles and people around town. And the big "No, No, No" sign that is observed if drivers think it might be convenient. The rice paddies near our apartment have been flooded and a "garden tractor" with a rotary-hoe was "mulching" in the grasses that had grown since the rice harvest. Yesterday we went to the Post Office to send a box of books home by surface mail. We had already established that surface mail was available despite having previously been told that only EMS courier services were available. Based on previous "sagas" at the Post Office we knew that the staff would want to inspect the contents of the box so didn't bother sealing it up. The staff gave us a form to fill out and fortunately it had both Chinese and English on it so we could carefully follow it. It was a multipage self-carboning form and unfortunately TJ didn't press hard enough and the bottom copy was illegible. Take 2. A new form was filled in with more force. Having done our best to fill in all the options (exactly as for the first form), we were told that the computer did not have one of the options we had selected. No, we could not just change the option, you must fill in a new form. Well why didn't you tell us that before when you saw what options we'd checked? Take 3. Once completed they said that the "return if undeliverable option" would cost twice as much because it would have to come back to China from NZ. No, we are not paying double in case the address is wrong. If it gets to NZ (our major concern) then it will get delivered to the address we've used for the last 5 years. Or the clever and friendly NZ Post people will phone us on the number we've given. Today we had a visit from Beryl, an English teacher from North Queensland, who was interviewing the JSAFC to see if she might teach here next semester. Wang Jin brought her to our apartment for a quick look at the accommodations and we had a long chat and a cup of coffee. It was fantastic to have another foreigner in our modest home and to be able to compare notes on each others experiences in China. We've noticed that in the smaller cities the "aliens", as we are officially known, tend to be relatively friendly. When we were leaving the University apartments in Nanjing, we met a young Swiss man and chatted with him as we all walked to the subway. In the larger cities like Shanghai and Beijing, white people are almost everywhere so the camaraderie is not so obvious. The Aussies and Kiwis get on well - perhaps our ANZAC culture is more unique than we realise. It is certainly different from the USA and UK cultures. We've spent this weekend in Nanjing with friends. Our main goal was to get a suitcase large enough to take our 600mm square picture home as there were none available in Jurong. Neil went off around the few supermarkets that we usually use and also to the Fuzimiao Grand Market, a large 3 storey indoor market just south of the Fuzimiao temple area. There was nothing suitable in the market and the supermarket offerings seemed adequate, but expensive. In the meantime TJ & Sam went with John, Joyce & family to view a replica of an ancient sailing vessel. Sam is very keen on pirates (of the nautical type) and plays "Port Royale", a computer game that pits various nations against each other in the Caribbean as they trade, battle and expand their empires. On Sunday, Hilary told us about the Golden Bridge Market. We hadn't been there and so took a quick trip there in the afternoon. What an Alladins Cave of treasures. OK the treasures were all for sale and required hard bargaining but it was most impressive. There were 3 buildings, one with 5 floors and the others with 3 floors. The floor area is massive and it is covered with walkways and 3x3m stalls. Fortunately it is laid out with like stalls grouped together. We found the luggage area and identified a few potential suitcases, but not at a good price. We had a little time on our hands and a back up source at the supermarket so could walk away from the poor deals. Finally one vendor relented as we walked away and we got a new suitcase for a fair price. On Monday we returned to the market to look for sandals for Sam and a handbag for TJ. Sam liked his old worn-out sandals and didn't want new ones. Finally the ultimatum came: "You choose some you like or WE will choose some for you". Grudgingly, some new sandals were selected and a fair, but not bargain, price was paid. TJ couldn't find a handbag she liked. We wished we'd found this market long ago as they are interesting places to wander around and there are bargains to be had! This market is (probably) called the Jinqiao market and is close to Nanjing Railway Station and opposite the Zhongyangmen Long Distance Bus Station. One of the benefits of the changed Jurong - Nanjing bus services is the several BRAND NEW buses that ply the route. The comfort of these CLEAN airconditioned coaches with nobody having to stand cannot be overstated!